Need a thoughtful gift for the travelers in your life? Want to protect loved ones embarking on spring break? Morrisons’ suggests surprising family or friends with a St. Christopher’s medal. Hide it in an easter egg. Make it a prize at Sunday’s Easter egg hunt. Gifting St. Christopher is the perfect acknowledgement for the younger generation making their first communions and confirmations. 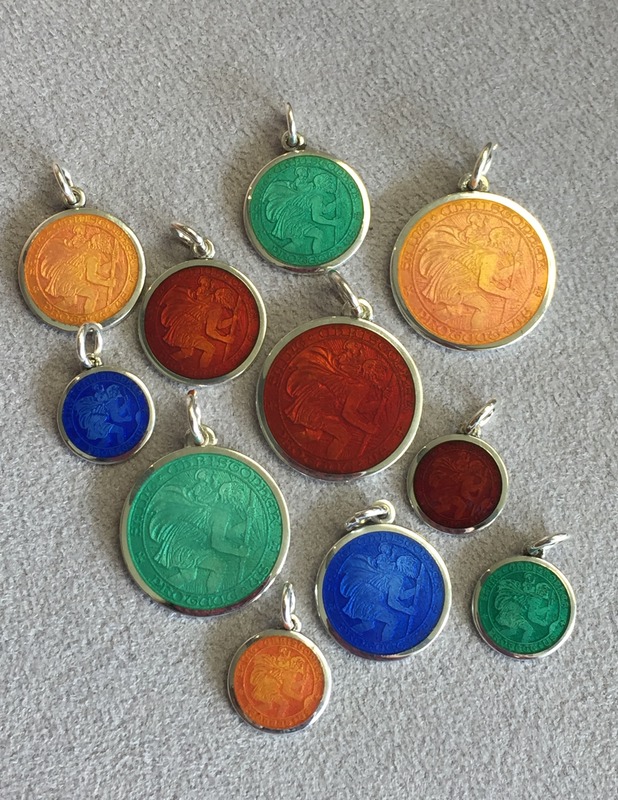 Sterling and enamel pieces run $60 to $90. According to legend, the formidable Christopher was over 7 feet tall with a fearsome face. In his youth he was promised to serve a king with allegiance to Satan. Christopher scoffed at them, finding both lacking in courage. He searched for a higher purpose. Christoper found a teacher, (a hermit), who taught him the Christian Faith. Although, large in his size and his willingness to serve, Christopher found kneeling and fasting unsuitable to his gigantic form. He chose to show his devotion by carrying people across a mighty stream. These labors set the stage for his famous deed. While ferrying one youngster across the treacherous water, Christopher was surprised by the weight he carried. When they reached safety, the child revealed himself as Christ. Christopher had been carrying the weight of the world on his shoulders, across the water. Further information, truthful or legend is unavailable about the end of Christopher’s life. Belief is he was beheaded in the 3rd century for pursuing his faith. His popularity after death has soared (even though the Vatican removed St. Christopher from the Roman calendar in 1969). Named a patron saint of numerous cities, England holds a special fondness for St. Christopher. As of 1904, the British Archaeological Association reported that iconography of St. Christopher from paintings to statues outnumbered all other saints with the exception of the Virgin Mary. In addition to travel, long journeys and dentists, St. Christopher is the patron saint of bachelors, athletes, lightning, gardeners, fruit dealers, and bookbinders. Let these colorful talismans be your safety guides.